Customers/you are paying for SMS Credits he/she purchased, and we/SMS Companies are paying to operators(vodfone, idea, airtel, etc) what is actually consumed from our all customers on monthly postpaid basis. 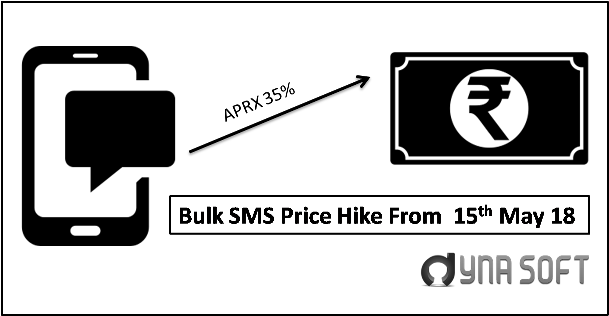 Now the case is we offered you price as per our old purchase rate with very thin margin but we will have to pay more aprx 35% whenever you/customers will send sms after 15th may 2018 because of this price hike. Our old purchase rate was 9 to 12 paisa/sms and we offered you 12 to 23 paisa/sms as per Qty & type..
so when ever you/customer will use sms after 14th May, for each sms we have to pay 14 paisa/sms + GST but.. So we will be in big loss Due to Sudden Price Hike..
1)we will Re-adjust Unused SMS Credits : Deduction 25% of remaining balance. Please note that price hike is up to 30% but we just deduct 25% with our loss for better customer relationship. -This is not for only DynaSoft or particular Company/Operator but the price hike and following procedure is common for all companies & all telecom operators. -Please check quotation we always mentioned that your sms credits are subject to change as per telecom operator/TRAI price hike. You already are aware that the telecom Industry in India is facing tough competition and going through a tough phase with a few operators winding their Businesses and the others facing huge losses and doing mergers. For the past few months, the telecom operators were continuously finding out ways to Increase their revenue sources and have finally planned to revised the SMS rates for Application to Person (A2P) traffic. They have Notified us that the Prices are going to Increase from 15th May,2018. However we still don't have a clear idea about the percentage Increase in Price, but it is expected to increase upto 35 %. We look forward for positive support from you. We will keep you posted about the Rate hike Information as and when we get communication from the operators. Great article, But if we talk about the rates. The rates increase by operator not provider don't worried about that. MSG Club provides the coast effective bulk SMS service in India. DynaSoft is a one of the Top SEO Companies and Leading Web Development Company in Ahmedabad which mainly offers professional services like Creative Website Designing, Customized website development, Software Development, Search Engine Optimization (SEO), Web Hosting and Domain Registration in Gujarat in India.